You’ve probably seen NAF! 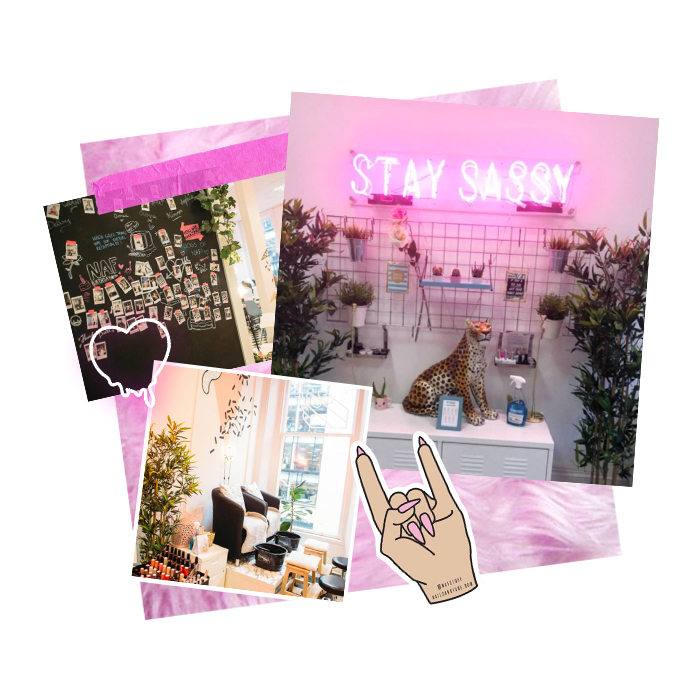 Salon with it’s dreamy 80s interiors and sick nail designs, all over the ‘gram. We know, SRSLY cool. 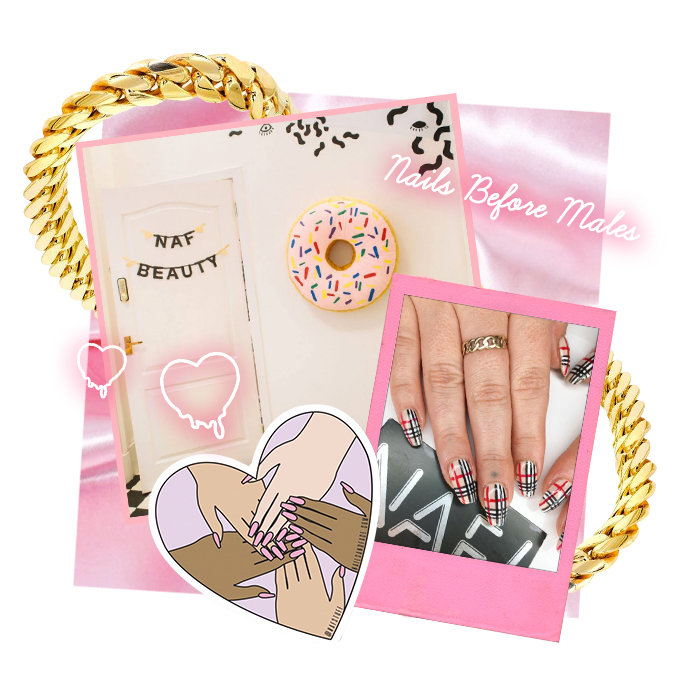 With a quick visit to their insta, you’ll be saving pics in your #NAILSPO folder for hours. And we mean hours, so you should probably clear your schedule.But did you know the boss babe behind the brand? We caught up with all round nail/motivation/dog queen Tammy Koslowski to find out how she did it. Here’s what she had to say..
First things first, what made you want to create NAF and how did you go about it? We’re all ears. What drives you? We’re SRSLY impressed by that work ethic. I can’t stop! I have to push things as far as I can, I get a real fire in my belly when I get new ideas and I want to see them through. I feel like I want to achieve all I can while I have the energy to do it, at some point in my life I’ll want to settle down with a family and lots of dogs so I wanna build my future and have a legacy. Fulfilling personal goals and achievements really drives me so I like to compete with myself and try not to focus on what other people are doing. Totally cheesy we know, but do you have a mantra or life quote you live by? You’re absolutely NAILIN’ it at the mo (hehe) – what has been your most ‘pinch me’ moment to date? You and your friendly neighbourhood nail gang are all kinds of work BFF goals.. what makes a good employee and what do you love most about your staff? This is a tough one, I think every role has its perfect employee but to me the most important things are honesty, reliability and likability. I feel like you can teach anyone a skill if they have an aptitude for it but you can’t change their moral compass or inspire charisma! I think the employer is just as important as the employee though, I make sure that I’m always available to chat to my staff and try to nurture them as much as possible. I’m very proud of my team and love to spend time with them and watch them grow as people and nail technicians. What is your absolute TOP tip for nail health? We need to know. What is your most fave nail design EVER!? I love anything tacky, as long as the execution is perfect! My all time favourite designs are burberry print, flames, barbed wire and camo. I also love bootleg designer branded nails like Chanel, Nike and Louis Vuitton logos. Are there any exciting new projects or products coming out that you’re allowed to spill the beans on? If you weren’t being an all round bo$$ babe at NAF, what would you be doing? I literally have no idea! I grew up wanting to be a Mermaid (no joke), then a Primary School Teacher then I studied Clothing Design and Technology at college/uni and really wanted to work for a magazine so I’d definitely still be doing something creative or fashion related. Failing that I’d be walking dogs for a living, I love dogs and being outside so it’s a combination of my two favourite things. Something we GOTTA ask.. where do you get your interior inspo from? The salon is all kinds of dreamy! I basically just wanted to create an instagrammable space that made people really happy to look at. I’m a sucker for kitsch/kawaii decor and I love pastels, 80’s surfer vibes (think Saved By The Bell) and plants so I think that definitely shines through. I’ve just lived out my craziest interior dreams in the salon (I painted a wall blue with clouds) and then my house is just grey and white. Which playlist or artists get the NAF team going? Girl, don’t even get me started. You can basically find all of our jams here but our best playlists are “NAF! 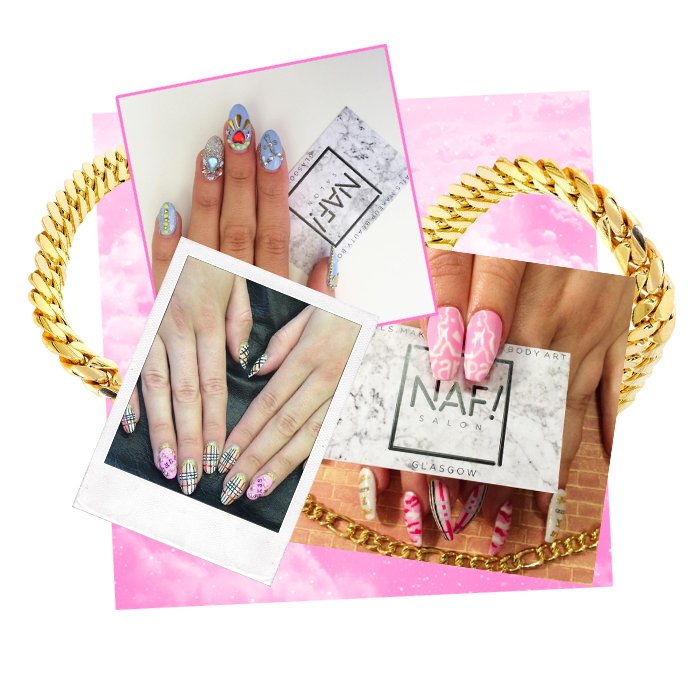 Party 💅🏼” (for daytime) and “NAF! Party 💃🏼” (for dancing). Personal faves are Nelly, Ja Rule, Mariah Carey, Destiny’s Child, N*Sync, Fleetwood Mac and I’m not shy about my love for ABBA! Bloody love ABBA.